It’s coming up to that time again, when we all wonder what to do with the lovely insides of pumpkins that we put out for Halloween. I’d made my soup and had some lovely pictures, then managed to delete the pen drive, so this is a legally borrowed one that looks identical to how mine looked. Enjoy your Halloween when it comes. Remember, when using soup maker recipes, never fill your soup maker above the maximum level from the manufacturer, no matter what the recipe says. We often use different soup makers, with different maximum levels. Would using canned pumpkin also work? I don’t know Yvette. I’ve never used canned pumpkin, but it’s worth a try. 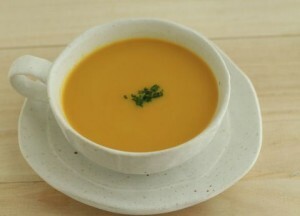 What an amazingly yummy soup, I used butternut squash and roasted the pumpkin in water first, to get a deeper flavour, also the pumpkin is easier to peel if first roasted.